Others can Support your Waist-training Journey; and the importance of those last pesky pounds! I love optimistic news items! I’m proud to be ‘a Pollyanna’ as my therapist BFF called me one time! How about you? If you don’t expect the best, then surely you will achieve and/or encounter the worst. That applies to everything in life, as far as I can tell. It clearly applies to corset waist training. That’s why I love this July 24 Natchez Democrat news story about success in weight loss and health improvement, but this time, weight loss and better health without a corset in sight. A church pastor weighing 308 lbs., decided to do something about his diabetes and weight—and he did it in a few short months, losing 70 lbs. He attributes his progress to many things, tho he now wants to drop 40 more pounds. Of course–we wrote to tell him about how a man’s stays and our corset waist-training program and book Corset Magic, could help him shed those last pesky pounds–the pounds that are often the very hardest to drop. That’s one key place in a slow, deliberate overall weight-loss journey where corsets come in handy and can be quite effective. They can help with an extra “push” and extra motivation and fun, to deal with the final few pounds and reach your goals. It worked just that way for Tim. Tim was our third-ever coaching program student who enrolled in 2003. He when down from 210 to about 190 lbs by himself over 7 months, then in two more months lost a few more lbs. while waiting for his man’s stays (a custom man’s corset by our then-corsetiere BR Creations) to be constructed and delivered. 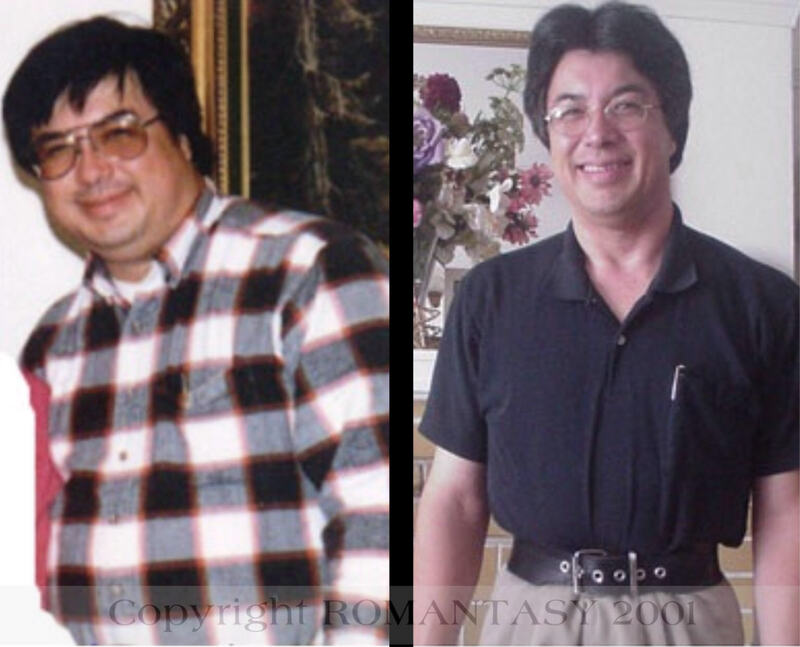 You’ll see Tim pictured before and after a one year shape-up journey, in the seventh row right on this page and pictured in this blog. The final three months of his year of weight loss, after Tim entered our program, he dropped another 4.5″ off his waistline and 17 final pounds to end up weighing 166 lbs! Sure enough, Tim has struggled a bit over the last 12 years to keep control of his weight–but at every juncture he has re-employed some of the strategies and techniques we taught him, and re-dedicated himself to health, first. Continued contact with us and with his former Training Buddy, has helped him recalibrate to drop some weight over the years. Key for him, and for anyone who wishes to try corset waist training, is the support of others. Bret, one of my esteemed friends and early coaching program student (2009), also pictured on the above ROMANTASY webpage, before and after his efforts to drop body fat content, feels as I do: organizing a consistent support system around you will almost guarantee your success (if you also set reasonable goals and are flexible in your definition of “success”; see prior blog about those two matters). You’ll likely need cheerleaders because waist training is demanding, much like competing in the Iron Man or Iron Woman challenge. You can “hit the wall” like a long-distance runner does, then benefit from an extra push along the way. Reaching your goal can be just as exhilarating to you, not to mention to your appreciative audience, as winning a gold medal at the Olympics to the cheers of your friends. In addition, it’s just plain fun to share your successes as you move forward. Some days your body will rebel and not want to accept the corset. Perhaps you’re hung over after a night of indulgence. Maybe a lady has the PMS blues and typical bloating. Sometimes a cold or the flu has kept you in bed for days, or your boss yelled at you and you want to flee both the psychological and physical demands that tie you down. Maybe you haven’t been “regular” for a few days and your innards just won’t be squeezed until the problem is solved. If you’re like many people and you try to waist train in private, you may get discouraged if no one appreciates your struggle and the results. Having someone to guide and support you—whom you can question, report to, show off in front of, and involve in lacing you into the corset or assisting with its removal—can encourage perseverance and help you feel less alone. You might get confused over some physical reaction you have. You might feel lonely and perhaps silly to be pursuing something so unusual. You might even find it boring. Or you may just want to ask your coach a question—or complain about your coach to a friend! Have you used a support system in your journey to waist train? We’d love to hear about it! “While Barrington’s results are intriguing, they should be interpreted cautiously. This study hasn’t been published in a journal yet, which means it has not been peer-reviewed. And it was done in laboratory mice, which are biologically different from people, and whose lives are significantly simpler. Five different diets were tried on mice, and all five groups did least well on the “American 2008 diet” of high sugar and high fat. Are we surprised? The reason posited for the emphasis on individualized nutrition, is that our individual genes predispose us to do well on different nutritional plans. It’s the same in corset waist training as a process of reshaping your figure and if you want it. As we know, reducing your weight which is not connected lock-step to waistline inch loss. While I can predict certain waistline inch loss and weight loss results in my 3-month coaching program students, usually evident half way thru the program at 1.5 months, sometimes I am surprised without any reason being evident. Each student can comply with the daily corset wearing plan, nutrition changes, and waist-targeted exercise plan I request them to pursue, yet reach, or not reach, the precise initial goals they initially set. But the real question is, is that a “failure” or is that a “success.” It depends on how you define those terms. What things are key to ‘success’ in corset waist training? I learned them by looking carefully at who succeeds in both my opinion and the student’s opnion, and who has failed in the three month coaching program at ROMANTASY. First, setting reasonable goals based on an honest survey of one’s genetic history and past successes or failures in dieting and figure shaping is required. How did those come about and what helped or hindered? My recently-graduated student Ms. T., set reasonable goals that were short of what I actually felt she could accomplish. They included being able to wear her corset as a foundation garment to improve her over all figure and compliment her rockabily outfits and vintage professional ensembles she preferred to wear for her public appearances as a model and author. Her goals also included being comfortable for long hours of corset wear, and improving her overall posture. My next step is to evaluate her final evaluation form just submitted, to discover how she felt about her accomplishments, and I’ll next report the results here. Second, setting up a program or strategy to defeat negative influences is key to waist-training success. For some students that negative influence is chocolate; for others it is avoiding family celebrations with cakes, buffets, and encouragement to “eat more.” Heather is a good example of that, as she lives in the South with an extended family who presses rich and tempting Southern food on her at all family get-togethers and celebrations. Cultural “pushes” are also key; my Chinese parents-in-law tend to over indulge at family get-togethers and yummie Chinese buffets they prefer–and if I don’t maintain close control of my inclinations, so do I! Yet others have to learn to deal with inevitable and stressful work deadlines. One lawyer waist-training student faced a financial filing deadline at the S.E.C., for a project she was lead on. She stopped communicating with me and dropped out of the program two weeks short of completion, eventually telling me that this was “my typical way of burying myself and cutting off connection to everyone including my family, during such a deadline.” The disappointing fact is that she never returned to complete her final two weeks, tho I offered it as an extension. When she asked a month later to enroll in another month’s extension of coaching (she would pay for it) to which I was agreeable, she then never completed the final requirements of her first three month program she had dropped out of. I saw the writing on the wall; expressions of desire are not equivalent to actions that prove desire. I did not accept the month re-enrollment, explained my reasoning to her, and pointed out that by now she well understood the techniques of training and could implement them herself, using her own excellent self-discipline in most circumstances, to get back on track and lose the few extra pounds she wanted to drop at the time she quit her initial program. Third, being willing to be flexible and adjust your program and goals during training, as you take weekly measurements/weight and record feelings and physical sensations reactions in a journal, is critical. Nearly every student whom I have coached has done this. Some have to get over a hint of “shame” in having to veer one way or the other off original goals, but it is unwise to remain rigid during training, and smart to make adjustments that keep the process comfortable, challenging, and fun. Fourth, being willing to experiment is key. Sometimes I don’t have the precise answer to offer, nor will your experienced corset maker. This became evident during Ms. T’s program once half way thru, her right rib started to become uncomfy after three hours of a 2.5″ reduction in her corset, even when wearing her well-seasoned wasp-silhouetted training corset by Sheri (perhaps the easiest to waist-train with). Rather than bear up and increase her discomfort, we adjusted her program to loosen back up to 2″ reduction and extend her hours to 10 or more per day, after putting in two hours at the originally scheduled 2.5″ reduction. Ms. T was satisfied with that decision, and so was I, since consistent wearing of the corset for long hours results in longer-term results in waist training that dramatic short-term reduction. Understanding the above four keys before you begin waist training, will take you a long way toward success in corset waist training and, most likely, in other matters and challenges in life! Re-shaping your figure does not mean you have to lose weight! I’m sometimes asked, how is it that you can lose waistline inches but not much weight? Here’s one example of a Canadian women who did just that in three months–exactly the minimum time I recommend that you pursue corset waist training. She did not use corsets but a strict exercise and nutrition regime to go from 200 to 150 lbs in two years, and to build muscle in the process. But, the pictures show that in three months of preparation for figure training, she completely transformed her fat-to-muscle ratio yet did not lose much weight in that time frame. These are excellent visuals for corset waist trainees who don’t want to lose much, if any weight, yet need to trim off a bit from the sides of their waistline to create more of an hourglass figure silhouette. Her amazing pictures show the results of dedicated efforts. It’s a point I address in my book–in-progress, A Primer on Easy, Fun and Fashionable Waist Reduction. (there are still a few FREE books left in our pre-sale offer: just send email and your contact information and email for our mailing list). That’s why I don’t recommend focusing on weight loss but on your waist measurement. A bit of weight will likely come off even if you are already eating clean, along with waist-targeted exercises and routine corset wear six days a week according to our “roller coaster method.” But if you keep your caloric intake about the same, your weight will stay about the same, unless you add substantially to your exercise routine. All we ask of our students is that they add first 20 min the first onth, then 30 the second then 40 min the third month, of waist-targeted exercises, along with whatever other program they are doing. Or, they may opt just to do the above, and most likely, they will still have success if reading moderate and realistic goals including improving their energy level, posture and sense of well being!